I smiled at him, but I said nothing. It has ever been my belief with men that it is far easier to allow them to make up their own minds and tell themselves whatever pretty story they want about your motives. They can think you love them or hate them, that you’re brokenhearted at leaving them or else that you have turned your heart to another. There is naught you can do about their fanciful imaginings, and it saves time and many tears if you simply let them believe as they will. Then they tell themselves their pretty stories and your soul remains unstained by the lie. As I looked at Master Culpepper from beneath my half-lowered eyelids, I thought it was a good thing he had auburn hair and those fine eyes, and that his features—I thought—resembled what my husband’s had been before he’d grown so fat. Any get of Thomas could pass as the get of Henry, the king of England. I smiled at him, my sauciest smile, and endeavored to appear lighthearted and fanciful and interested in nothing but my pleasure. Or perhaps half mad in love with him, which Thomas would probably fain believe I was. He’d grown very vain. “Should one not speak?” he asked. “When such grave matter is afoot?” His hand, more forward than his brain, quested still in the warm reaches of my bodice, and by that questing hand I knew I had him. He might think, and he might talk, but his body would no more let him walk away from me than it would let him ascend to flight like an angel bound for heaven above. “Dare you not, Thomas Culpepper? And I thought you a brave man.” Which by all accounts I should well think him—in the field of joust and in dispute, he stood with the most gallant courtiers. In his eyes I read lust mixed with a little fear. He would never be allowed to see the fear in mine. I kept my gaze level, my smile broad. He would never be allowed to know that as I stood here, in my velvet gown, my sparkling jewels, I walked a narrow path between two deep abysses. If he died, he left nothing. Two daughters and a small son who, though he might be a lusty infant, would still be a pawn of every pretender, every hand against him. We would find ourselves again as in the time before the king’s father when my grandmother said every man had been against every other and no one safe. And I, the relict of the sovereign, would be the first to lose life and limb in such strife. Only one thing would protect me, and hold me on the throne, and that was that my womb should ripen with a child. But that was impossible as my husband did little that could lead to such an auspicious result. And so, at this moment, in my peril, I must seize upon another who might impregnate me, and whose son I could pretend to be Henry’s. Of course, discovery of my treason would lead to death, but so would Henry’s death without having seeded my womb. I half closed my eyes and wondered how I—who had wanted nothing more than to keep myself free from any man’s single, brute power over me—should have come to this. So this be your get, Edmund Howard!” the old lady said, and the way she said it made it clear she disapproved. She looked very great and more important than anyone Kathryn had yet seen—tall and well arrayed in shining satin and splendorous brocade. Her face set in a mask of disapproval as—her back very straight, her eyes hard—she walked down the line of Kathryn’s siblings and looked them over with the kind of speculative glance Kathryn had seen the Howard housekeeper give a side of beef in the market or a row of ill-plucked chickens. Her eye ran over Kathryn’s brother Charles, just fourteen and looking very much like someone had taken an end of him and stretched him up, without making sure that his limbs and form should match his new, greatly increased height. Like all of Edmund Howard’s children, he had been dressed in new clothes, or at least as new as their father’s diminished fortune could command. The hose were somewhat faded, but they matched the doublet, which was a new and brilliant shade resembling orange peel. 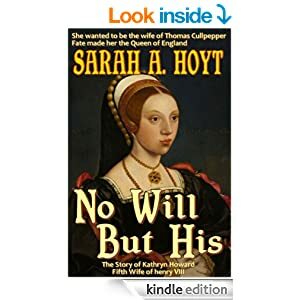 Even then Kathryn thought that it was a right pity that Charles’ hair, too, should match the doublet and, as he blushed under the old lady’s look, so should his face, which became ruddy under a smattering of freckles. “Umm…” the lady said, and passed on. Her walking stick tapped the ground in rhythm, as though she were keeping pace with her thoughts. Tap, tap, tap. And she stopped in front of Kathryn’s brother Harry. He was, like Charles, ruddy and redheaded, but the hand of God had as yet to take hold of him and stretch him to a man’s height with a boy’s frame. Instead, he was almost as short as Kathryn and twice as round, the freckles on his face making it look like an apple that has got speckled from waiting too long in the cold cellar. The lady didn’t pay any attention to him, anywise, but tapped her way to stand in front of Kathryn’s brother George. George did not have the carroty hair that had, mayhap, come from the Culpeppers, the family of Kathryn’s mother. Instead, his hair was a dark auburn, like Kathryn’s, and his eyes, like hers, were broad spaced and dark. He was a year older than Kathryn, and she remembered that their last stepmother had accounted him a right proper and pretty child, and petted him much and made much of him, even though she had brought eight children of her own onto her marriage with Kathryn’s father. Kathryn had been jealous of him, then. Since her mother had died, no one had made much of her. But Kathryn’s nurse had told her envy was a sin and that if she persisted, the devil would come and take Kathryn entire to hell and leave only a little burned mark after. Now it seemed as though this old lady they’d come to visit was also thinking how pretty George was and considering making much of him. Kathryn stood only a little away from him, with her sister Mary in between, and tried not to look around Mary—who was fifteen—to see the expression on the lady’s face. If the lady said George was the most beautiful child she’d ever seen, Kathryn felt that she would likely burst, like an unseasoned log thrown onto a hot fire. Not because she wanted the grand lady’s attention, but because the favorite of the family was always George, or else one of the other boys, or else yet Mary who was pretty and marriageable. For all the attention anyone ever paid her, Kathryn might as well have been as clear as water or as immaterial as air. This time Kathryn dared look around Mary’s skirt. She didn’t fully need to, because she could smell the acrid odor of urine thick in the air, and sure enough, on the front of George’s hose and down his leg, there was a wet mark and a puddle forming beside his slipper. Again Kathryn’s father tried to say something, but the lady paid no more attention to him than she did to George, left standing there in his wet hose. Kathryn heard George sniffle and guessed that shortly he would start to cry, but she was more worried about the lady who now stood close enough to Kathryn for the little Howard daughter to discern the fine lace ornamenting her expensive clothes and to smell the wondrous rich perfume of her garments. Edmund Howard mumbled. Kathryn could get from his voice nothing but the words “not sure” and the words “believe so” as well as “Leigh.” Leigh was the name of her older brothers and sisters, the children of Kathryn’s mother’s first marriage, before she’d married Father. The lady snorted. “Just like a fool,” she said. “To buy the house without first making sure it was untenanted.” And she walked past Mary and stood now in front of Kathryn. Kathryn stood straight, determined not to cringe and not to slouch and not to wet herself, like George. That morning, when she’d seen the little girl attired in her new clothes—a fine bonnet of satin and a gown of sarcenet, better and newer than anything Kathryn had worn since her mother died—Dame Margaret, Father’s new wife, had told Kathryn to be good and behave like a grown maiden and not a child while they visited with the duchess and that if she did not disgrace herself, Dame Margaret would give her oranges. She would not disgrace herself. Instead, she kept her eyes on the floor, which was a yellow mosaic, and felt the blaze from the great fireplace to her right. Though outside it was warm spring, a sort of damp chill clung to the room so that, with the proximity of the fire, her right side baked while her left froze. She looked at the floor and expected the stick to start tapping again at any moment, as the lady gave some opinion of Kathryn and moved on. Instead, a hand like a great claw came to take hold of Kathryn’s small, pointy chin and pull it up. The hand felt dry as paper and as tough against the little girl’s skin, but its grasp was like iron. It tilted Kathryn’s face up to look into the face of the old lady. Her nose was just a little hooked, just like the nose of Father’s new wife, and her eyes were dark grey and keen, giving the impression of seeing right through people. “What is your name, chit?” she asked. “A grace she must get from her mother,” the lady said, cutting whatever else Kathryn’s father might have wished to say in the girl’s favor. Kathryn’s mind was turning on the words into service, very much at doubt as to what they meant. The Howards had servants, of course. More when her mother was alive or when her father’s last wife, Dame Dorothy had been alive, because their money sustained—her father said—more people to attend them. But even on Father’s money before he married Dame Margaret, they had attendants. People who cooked and tended to their clothes and emptied the slops. Was Kathryn, then, to be one of these? Every sense revolted. The servants at the Howard home were village boys and girls, whose fathers were farmers or servants themselves. And if there was a thing she knew, and knew well from her childhood—many times repeated to her by her late mother—it was that her name was Howard, and she was the granddaughter of a duke. “And you have not been granted full access to your new wife’s fortune, she being no fool,” the lady said and snorted. “Very well. I will take one of your sorry brood.” She looked away from Kathryn and toward the beginning of the line and Charles again, and Kathryn could hear her stick go tap tap tap tap tap on the floor as she considered each of the Howard siblings in turn. Charles—tap—Henry—tap—George—taptap in annoyance, followed by a loud sniffle from the despised boy—and Mary, whose renewed curtsey only earned her a taptaptap. And then to Kathryn. And her stick stopped. Kathryn felt her hands clench into fists. “But the oranges—” she said. More quickly than Kathryn could think, the girl had her by the hand and was pulling her along.Kathryn never saw her father again. And she never did get the promised oranges.